One of the many differences between a good player and a great player is knowing when to play on for the gammon and knowing when to turn the cube. 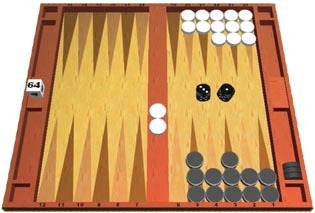 Playing for the gammon also affects checker play ... how much to risk the game to win the gammon. In money games, this is a major decision, and sometimes it is right to cube even if it is technically too good to double if you might get a take. But before you can learn to read your opponent, both in money and match play, you need to read the board and know what the right decision is. In money play, the decision is based on a simple principle: go for the gammon if the odds of winning the gammon are twice as good as the odds of losing the game. That sounds pretty simple, but over the board it can be quite challenging. In match play, the decision is complicated by the score. If winning a gammon wins the match, clearly there are more reasons to go for the gammon. Conversely, if losing the game costs you the match, there is a greater incentive to play for the single win. With all of those factors to consider, it is no wonder that even the best players in the world are often unsure whether to play for the game or play simply for the win. Here is one general rule I try to live by: If I am not sure whether to play for the gammon or play for the single win, I play for the win. That either means I turn the cube, or I make the safer play. In the long run, you will be better off taking the more conservative approach. Also, even when you take the more conservative approach, you still might win a gammon or you might still get a take from your opponent. Many times your checker play decisions will not force you to make the big play or the safe play, but rather a play that helps both the win and the gammon. Now, back to the original question: How do you know when to play for the gammon or when to play for the win? And the answer is: You consider all of the variables above and then make your best guess. The difference between a pro and a novice is that a pro's guess is based on more knowledge and experience. The more experience and reference positions you have to call on, the better informed your decisions will be. How do you get reference positions? The only way I know is through study. 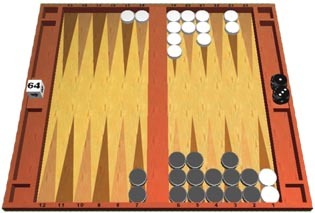 There are great reference positions in many backgammon books, but another way you learn is by constantly putting positions into Snowie or the other bots and seeing whether you should play for the win or go for the gammon. The more you do this, the better you will be able to estimate over the board. There are some reference positions that come up often, and it is very helpful to know the gammon odds in these positions. Even if the exact position doesn't come up, if you have the reference position in your head, you can estimate from there. For example, I happen to know that if I have two of my opponent's checkers on the bar and I have a closed board with a good bear-off position, I will win a gammon about 40% of the time. Knowing this helps me decide how big a chance I need to make in my checker play on the bear-off to win a gammon, depending on the match score, what I roll, and how early my opponent enters with one of his checkers. Now, since I know in Figure 1 that I win about 40% gammons, when I get to a position like Figure 2, I can adjust my estimate. What do you think the gammon odds are for Black in Figure 2? The answer is, about 53%. Now, I don't remember being in the exact position shown in Figure 2, but because I know I have a 3 checkers off and my opponent is still on the bar, I know it's a lot higher than 40%, and from experience, I thought it was somewhere between 50 and 55 percent. Now, let's take another look at Figure 2 and see why it is important to know that Black wins gammons about 53%. In most money and match games, the cube has probably already been turned in this position and is on White's side of the board, so it probably doesn't affect Black's cube decision, but it can greatly affect Black's checker play. For example, what if Black were to roll a 3-1. How would you play it? 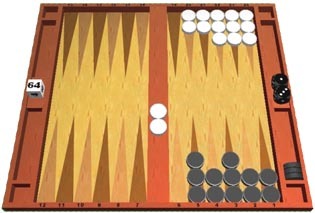 Clearly you have two reasonable choices: you can make the safe play and use the 3 to move the spare checker off the 5 point which eliminates the chance of leaving a shot on your next roll, and possibly even on your next 2 or 3 rolls; or you can take a checker off the 3 point and move the 1 from the 5 to the 4. Taking a checker off clearly wins you more gammons but risks more blots and therefore potential losses. The answer depends on the score. In a money game, and at most match scores, it's probably right to take a checker off, as you gain a lot more gammons that you do losses. You should probably play safe only when gammons don't matter at all. It turns out that taking the "riskier" play nets you almost 5% more gammons and only costs you less than 1% in wins. Another common reference position is when you have a prime and your opponent holds your 1 point. The percentage of gammons depends largely on your opponent's timing and his board, but assuming he has reasonable timing, I know that the odds of winning a gammon are only around 15%. Knowing that I am about 15% in this position allows me to adjust my checker (and/or cube) decisions accordingly as the game progresses. It also allows me to adjust for slightly different positions. If he has more checkers in the outfield, for example, my odds go up. If I bear off 4 or 5 checkers and he still hasn't escaped a checker, again, my odds go up. A third checker back on my ace point actually doubles the odds and makes me about a 30% favorite to win a gammon. There are formulas to apply, knowing that for each pip the opponent needs to roll to get into his inner board the odds of the gammon go up a certain percentage, and there are methods of counting cross-overs. All of these formulas are extremely helpful, and again, much of this information has been shared with us by the experts in their many fine books. 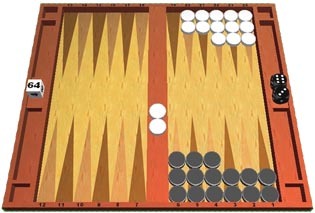 It is not my goal to get too technical here, as the purpose of this article is to encourage you to start thinking about the variables involved and the fact that if you really want to play backgammon well, this is one area of the game you simply have to study and memorize. Study? Memorize? That sounds like school! That sounds like work! But just like school and work, there is a payoff when you do your homework. In this case, the payoff is winning more. I love the quote from Abe Lincoln: "If I had six hours to chop down a tree, I'd spend the first four sharpening my axe."